The proposed aged care facility on the corner of Hopetoun Circuit and Grey Street, Deakin. The Hopetoun Circuit entrance has been dropped. 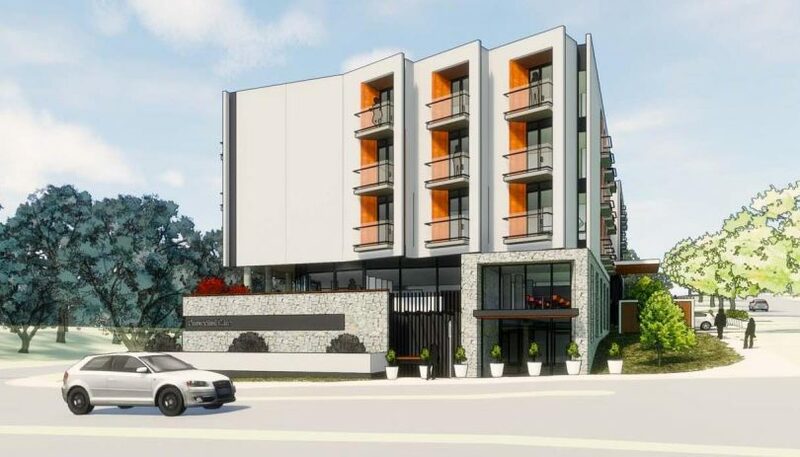 The Deakin Residents Association has won concessions from the developer of a multi-storey aged care facility in Grey Street that it believes will ease traffic concerns in the area and reduce the building’s visual impact. Provectus Care had proposed a four-to-five-storey, 102-bed facility on the 2973 square-metre site of the Margaret Dimoff Art Gallery, formerly known as the Solander Gallery, on the corner of Hopetoun circuit and Grey Street. It was to comprise 90 residential care accommodation beds, 12 assisted living unit suites and a 40-place seniors’ day-care respite facility. But the Association believed the proposal was inappropriate for the site and would exacerbate the traffic chaos in the area, particularly at school drop-off and pick-up times. The planning authority and the National Capital Authority approved the development application in March 2018 but the Association took the matter to the ACT Civil and Administrative Tribunal where the concessions were only recently negotiated. The Association said the outcome would reduce the building’s traffic and parking impacts in the suburb, and laid the groundwork for significant improvements in pedestrian safety and for other road users in Hopetoun Circuit. It would also lead to further negotiations with the ACT Government for a workable solution to the traffic chaos on Grey Street in school peak periods. Additional landscaping on the site would also make the facility less intrusive. The Association said there would now be more parking on site with an additional basement providing a net increase of 15 spaces on site, reducing demand on adjacent streets and around the Deakin shops from staff and visitors. The number of daycare patients had been halved from 40 to 20, which should reduce traffic to and from the facility in periods when school traffic is significant but the trade-off was a possible extra three beds. There was an in-principle agreement to another pedestrian crossing on Hopetoun Circuit, which would be raised to slow traffic, the speed limit was proposed to be lowered to 40km/h between Adelaide Avenue to just past and into McGregor Street, and pedestrian safety islands were proposed in Gawler Crescent and Grey Street. The Association said the Hopetoun Circuit entrance had been axed and a row of large evergreen trees would now hide the facade and reduce the visual impact of the building, as well as there being additional landscaping adjacent to the north-eastern courtyard wall that would be visible from Adelaide Avenue. “While we did not get everything we argued for, the result is a major improvement on the original proposal,” the Association said. The Association will be involved in consultations on all these changes. What does this say our government reps when these ‘concessions ‘ have had to be extracted by Deakin Residents Association in ACAT. I hope the DRA will be recompensed by the ACT government for doing its job. Another rack em and stack em people farming enterprise no doubt - with one registered nurse to every 90 residents — based on all the other operators in town.